We now have a rolling schedule of workshops and demos throughout the year: keep checking the website because new workshops will continually be added. In addition, we think you’ll like our new pricing structure and our new Free studio time that corresponds with the number of class hours….check it out! Read about our instructors here. Students will be contacted a few weeks before class on what supplies or items they may wish to bring with them to use during class. Frontline Arts provides the space, resources and time for experienced as well as novice artists to explore creative expression and develop a serious artistic practice through art education. Our progressive curriculum offers foundation level courses and advanced techniques in innovative printmaking. FA's education program is a transformative, lifelong learning experience that enables artists to grow, to evolve, and to develop their own unique artistic voice. Registration and full payment is necessary to reserve space in any class. Material fees must be paid with registration. Materials list (if applicable) and confirmation will be sent prior to start of class. A Full refund is given if cancellation is received up to one month before the class. A 75% refund is given if cancellation is received up to two weeks before the class. No refund is given for cancellations received less than two weeks from the first class date. A full refund will be given if the class is cancelled by Frontline Arts. The Printmaking Center of New Jersey is certified as a New Jersey Department of Education Professional Development Provider. 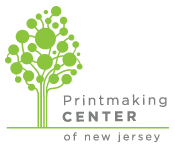 This designation establishes that the Printmaking Center meets all requirements for providing New Jersey educators with mandatory professional development courses. ​These courses are widely attended and lauded by New Jersey art teachers. By providing educators with innovative classes in printmaking, papermaking and book arts we enhance fine art school curriculum throughout the state.